Are you throwing a birthday party, circus theme party, rainbow party, or fiesta?! 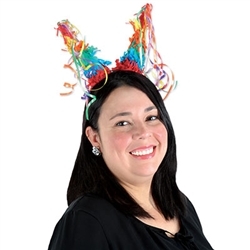 Accessorize your outfit with the colorful Piñata Headband and you will be the center of attention wherever you go! Attached to a red plastic headband are two cones covered in rainbow colored tissue with colorful ribbons attached to the tip of each cone. This fun, colorful headband will set your outfit apart and make you the life of the party! One size fits most. Contains one (1) per package. Due to hygiene-related concerns, this item is not eligible for return.